Event Poll: What’s your favorite? Traveling to events, trade shows, fun flys and competitions is a great way to increase your experience and a fun way to learn new things about the hobby. The MAN editors travel across the country to cover national and regional events so we can bring you our readers, the latest and greatest news and happenings. Where do you like to go and why? Fun flys are my personal fav, nothings better than getting a group of friends and tearing up the sky! I live in Baltimore, MD, and for the last few years have been going to the Deland RC Festival of Giants. I pack my truck and take the AutoTrain down, so I can experience Planes, Trains and Automobiles.) What I enjoy about the event is that it attracts scale planes, war birds, aerobatic planes and some custom wacky designs such as a flying Sponge Bob. The host field is a great facility and the host members go out of their way to make guest pilots feel at home. I look forward to traveling again this year! Midnite Publix Fly-in. This event favors the Slo-Stick, but has been joined hand-launch gliders, bungee-catapult gliders and foamy wings. It is totally non-sanctioned and plays in a huge evening thermal and deals with problems of a tight flying area, variable wind conditions, minimal lighting, and random drunks passing through. ..absolutely the most consistent flying fun I’ve ever had. So if you notice some random people staring into the night sky in the middle of the night, in your local grocery store parking lot grab a robust park flyer (white ones are best) and join the melee. I always have more fun at a club event, and I study the events calendar and try to travel to as many as I can every season, within a 2 to 4 hour drive from my Hudson Valley NY home area. My favorites are my own club’s annual Jamboree at old Rhinebeck, Warbirds over Delaware and the Central Ct. RC clubs Big Biplane Bash. When I am at an event, I don’t even have to fly to have a great time!! I live in Ocala, FL but I attend the “Champlain Valley of the Giants” event every 4th of July in Westport, NY. You covered it in MAN Dec 1997! 17th Pursuit Squadron/Flying Pilgrims in Ypsilanti, MI. Each year they put on a spectactular weekend show featuring giants and jets, with many custom planes. It’s a fun-flyin for the pilots and spectators alike. They have a great 40 by 500 foot paved runway, free food for the pilots and a raffle each day. A great way to end the flying season! I love the NEAT fair and other fun-flies the most. As a CD for quite a few years, I noticed the more relaxed fun of the fun-fly was better than the competitive types of events. With no competition, people at the the fun fly just want to have—-fun! Kids who are just learning how to fly with their dads and other noobies participate without anxiety and our hobby grows! “Just my two cents”. SEFF is one of my favorites, but HHAEFI is my absolute favorite! It maintains all the best features of SEFF, but with a fraction of the pilots the event is much more intimate. 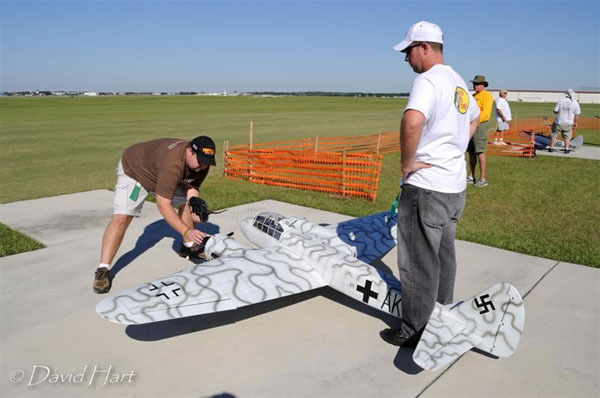 My favorite event is the (mostly) non-flying Southeastern Model Show and Swap Meet hosted by the Georgia Aircraft Modelers Assn. Inc. at the Georgia State Fairgrounds in Perry. It’s a chance to look for that discontinued kit or built plane you always wanted, pick up some stuff that only you would be interested in for pennies on the dollar, (brushed 540 motors for 50 cents each), crystals and RXs for your still reliable 72 mHz radios, rare gizmos and parts of all descriptions, plus lots of discount priced new stuff. Most of all it’s a chance to swap lies with more model airplane coots than you’ll ever see in one place outside of the the Nats or Joe Nall. It’s a five hour drive for me but I wouldn’t miss it for the world. It’s coming up in about two weeks, Feb. 28th and March 1st. Joe Nall, I live 45 min. Away. Gerry- I’ve been thinking about this since reading the note on my phone this AM/. Everytime I think I had a definite list, then another event comes to minde!! We are fortunate here in the NE to have some great, large events (Rhinebeck Jamboree, Warbirds over Delaware, NEAT Faire), and a lot of fine, smaller ones, with your own Cenrral CT RC Club’s Biplane Bash heading that list. We’ve enjoyed events run by the Johnstown, NY, RC club, those held at Chenango Bridge, and Warbirds over PA. Non- flyibng events- WRAM show, of course!! Ask me next year after I’ve spent some time in our new home in TN!! Ar 76 and Yaks are all different. SEFF. It is a great party type of event built around a low-key commoradary and focused on fun. I have not had the pleasure of the NATS or other evens out of the southeast, but the low-key atmosphere compared to event-type flyins (e.g. Joe Nall – which I really like for different reasons) is a great draw to me. Warbirds over Delaware i went there with my best flying buddy a few times and got the nerve to fly in the noon time ww1 gaggle with about 30 other planes. what a rush! Iv’e been hooked ever since. My all-time favorite is Rhinebeck. I never miss it. Warbirds Over Delaware is my other must attend. I enjoy going to Toledo and the WRAM Show. All are a days drive away for me. I like Fun Flys because I’m not that competitive and like to see what other people are flying. E-Fest – Held in February every year at Champaign Urbana, IL, University of Illinois Armory – Although I have not yet been able to attend because I am always in Florida at that time, the Armory is very sentimental to me. I grew up in Champaign and flew U-Control Models in the Armory from age 13 (1945) to 25 (1957)at a time when Champaign Urbana didn’t have much in the way of hobby shops, but now has some of the top model aircraft hobby catalog stores in the USA.. We held a couple U-Control contests in the Armory which could accommodate two circles using 70 ft control lines which could clear the ceiling vertically. During that time the Armory had a dirt floor with a concrete track around the outside. The Armory has now been turned into a very plush field and track facility which is perfect for the E-Fest. IMAA ANNUAL CENTRAL COAST GIANT SCALE FLY-IN SANTA MARIA, CALIFORINIA IS THE BEST. COOL SUMMER DAYS, OLD SPANISH SURROUNDINGS, AND OUTSTANDING VIEWS OF THE COASTAL HILLS. ONLY THING BETTER ARE THE PEOPLE YOU MEET. GO TO RC FLIGHDECK AND CHECK IT OUT. SLRCFA.com annual fly-in every June near St. Louis. 1/2 scale, 3d and jets at of the best fields in the country with full-scale landings and the works. Best kept secret in RC. 2nd: Joe Nall. Gotta go every year. I specially like going to the Maine Jet Rally in Sanford, ME, because it’s a great event and because it’s not 2,000 miles from home!